Motorola Moto X (2014) review | What Hi-Fi? The new Moto X launched without any of the fanfare or fuss that we’ve come to expect from a flagship smartphone in 2014. The improved successor to last year’s phone of the same name, it has no headline spec to shout about, no attention-grabbing feature list to boast of. And yet, it still manages to be one of the best smartphones of 2014. Buy it as it is and you’ll get the 16GB black-resin model, which offers a soft-touch rubberised back panel, lightweight design and aluminium frame. However, one of the unique things about the Moto X is that you can custom build your handset using Motorola’s online ‘Moto Maker’ service. This allows you to decide between a black or white fascia, pick an accent colour for the speaker grilles and choose from a selection of colours and materials for the back panel – including leather and FSC-certified wood for an added cost. It’s also through this service that you can request a boost to 32GB of onboard storage – something worth considering, since the Moto X is unfortunately non-expandable. Once you’ve got the Moto X to your liking, it’s time to explore, and you’ll quickly learn the attention to detail in its design doesn’t stop with its physical customisation. Its softly-curved back panel nuzzles nicely into the palm of your hand, making it comfortable to hold, while its textured power button and volume rocker – the sole buttons on the handset – lie on the right-hand side at the right height for quick access. Motorola has taken tips from the LG G3 book of design too, and has managed to squeeze a 5.2in screen into a really compact shell; smaller hands should be able to negotiate it without worry. That screen has gone Full HD this year too, up from last year’s 720p display that caused the Moto X to be immediately outclassed by many of its rivals. While there may be a handful of 2K screens doing the rounds this year, the Moto X isn’t left behind; its 424ppi display looking sharp and punchy, with blacks as inky deep as only AMOLED screens can get. The colour palette is on the warmer side of neutral, but colours are still believable and don’t look overdone. There’s plenty of fine detail too, which helps to give a great sense of depth to scenes, and contrast is strong - offering plenty of detail in the shadows. Its warmer colour palette does have an impact on whites though, which is perhaps less noticeable in video than it is in browsing. Pages look creamier in colour than that of rivals. We’re sure it’s something you’d adjust to (or maybe wouldn’t be bothered by), but the purist in us would prefer it to be cleaner. Viewing angles are good, with colours not dropping in vibrancy and blacks staying deep when viewed a little off-axis. Screen brightness levels are strong enough that viewing video outdoors is possible too. The other Moto X specs are pretty competitive. There’s a quad-core 2.5GHz Snapdragon 801 processor and 2GB RAM under the hood, which keeps things moving along without a stutter, there’s NFC connectivity on-board for one-touch pairing with compatible kit and a new 13MP camera with a f/2.25 lens and dual flash (up from 10MP on its predecessor). Pictures taken on the Moto X will work fine for quick snaps and social sharing, producing clear, decently detailed images in good light with a largely accurate colour balance. Autofocus is a little on the slow side compared to the best, and isn’t always reliable, while there are occasional issues with exposure too. Using tap to focus helps to speed things up and corrects most exposure problems, but there are still times where it’s caught out and you’ll need to try again. We found indoor shots are a little more prone to noise than we notice elsewhere, and compared to shots taken on the iPhone 6 Plus, there isn’t the same level of fine detail and subtlety that those who take their smartphone photography seriously will crave. But its low light photos are really the weak point of the Moto X: with images looking soft and undefined. Noise is more of an issue here too, but the new dual-ring flash does help to bring a more natural-hued flash onto darker situations, should you need to. It’s a case of could do better then. But for most people in most situations, it’ll be far from a deal breaker. With video, you can shoot in a choice of 1080p and 4K, with a slow-mo video mode at 120fps also available. As you might expect, 4K video is a storage sapper - those with only 16GB of built-in memory may want to bear that in mind when shooting. When it comes to audio, the Moto X will perhaps be a little on the tubby side for some tastes, but it makes up for it with a lively, exciting character and expressive midrange. There’s never any hint of harshness from the treble, even when dropping down from our CD rips to streaming Spotify, and though it is undeniably full bodied in the bass, it’s not overpowering or boomy. We’d take a touch more clarity and subtle detail if it was going, but it proves itself to be an enthusiastic and entertaining listen all the same, particularly if you pair it with some decent headphones. Battery life is respectable for its size, offering up to 10 hours 21 minutes in our battery rundown test and, with Android L’s battery saving features coming soon, we could well see these figures improve. What’s arguably nicest about the Moto X though, is the way that Motorola has handled the software side of things. On-board is almost pure Android 4.4.4, with just a smattering of Motorola tweaks that only add to the experience. You’ll certainly find no bloatware here, and next to no Motorola-specific apps either – with Moto leaving things like video and music players in Google’s capable hands rather than doubling up with its own. In fact, the only hint of Motorola you’ll find is in its migration app, which helps you to transfer your content from a previous phone, and in the ‘Moto app’, which offers some really useful and intuitive added extras thanks to the phone’s ‘always on’ sensors. ‘Moto Display’ is one of the biggest parts of this, which enables monochrome notifications to show on the lock screen when it senses your hand approaching it, with an aim to save on battery life. Being an AMOLED screen, it’s able to simply light up the pixels it needs to show you whether you have message/missed call/Facebook notification (you can customise what it’ll show you within the ‘Moto app’), saving battery compared with firing up the whole screen every time you want to check. You can then press any notification bubble to preview the content, or swipe down to unlock and see it in its entirety. These sensors also work with other gestures, such as double twisting your wrist to launch the camera or waving over it to silence calls or alarms. ‘Moto Assist’, on the other hand, offers contextual assistance, such as automatically switching your phone to silent when it sees a meeting in your calendar or reading texts aloud to you when it knows you’re at home or in the car. Finally, ‘Moto Voice’ is Motorola’s skinned version of ‘Google Voice’, which offers more flexibility, such as the ability to change the standard ‘Okay Google’ command to whatever you want. Since its sensors are always listening, Moto X can be woken by simply saying your chosen phrase too, which worked without fail in testing – even when we tried to catch it out. In fact, we found all parts of the Moto experience to work seamlessly, and you can opt in or out of as many of the things as you would like. We opted in for them all, and they only took a few minutes to get set up, with a few notifications when you first set up the phone helping to walk you through each one. If we’re honest, it has been somewhat of a surprise at just how good the Moto X is. Its specs are competitive, and much improved from last year, but hardly makes the phone stand out in the crowd. There are no bells, no whistles; nothing screaming ‘pick me’ over any of the other flagship phones on the market. But get it in your hand and start to use it, and you realise that everything it does have, is everything it needs – besides, perhaps, expandable storage. The almost-pure Android experience is so good, it’s frustrating that other companies feel the need to be so heavy-handed with their skins. 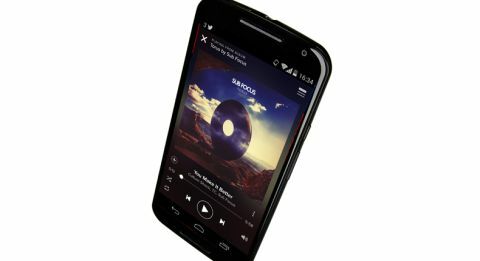 And the added Motorola touches are so intuitive, they’re not just useful, they become second nature almost immediately. Add to that a super-fast performance, wonderfully sharp screen and the ability to customise your handset in a way that means you don’t have to hide it behind a case or cover to make it your own, and it’s fair to say we’re pretty smitten. Put simply, the Moto X just works, and is a joy to use in the process. If you’re looking for heart-rate monitors and fingerprint scanners, you’ll need to go elsewhere. For one of the best Android experiences available at a comparatively reasonable price, however, the Moto X is really worth a look.